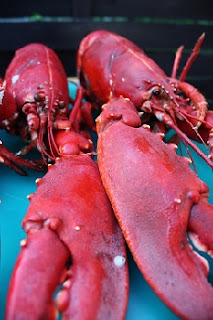 Aplia Econ Blog: News for Economics Students: Got Lobster? It’s a good thing I don’t have to watch my cholesterol, because after moving to the Maine seacoast last July, I simply cannot get enough lobster. Though I haven’t had to worry about the health cost of consuming lobster, I have been paying attention to changes in the dollar cost over the course of the season. Monitoring prices doesn’t get any easier for this lobster-loving Mainer because every day on the way to my son’s school, I drive by a sign advertising the current price. The start of the lobster season coincides with an increase in the demand for lobster as summer vacationers head to the Maine beaches. In York, Maine, alone, the population triples during peak season then drops back down again once the school year begins. An increase in demand means upward pressure on price, while an increase in supply means downward pressure on price. As lobster season came to a close in the summer of 2012, however, word on the street was that there was a surplus of lobsters. With quantity supplied larger than quantity demanded, downward pressure dropped lobster prices to an astonishingly low $2.99/pound for chix (lobsters weighing between 1 and 1.24 pounds), making lobster in southern Maine cheaper than a good steak at the time. As lobster season ended and the bitter winter set in, the per-pound price of lobster started to tick upward. This is consistent with the basic model of supply and demand—once lobster season was over, supply decreased which put upward pressure on prices and demand decreased which put downward pressure on prices . Over the last year, it appears that supply changes have been more drastic than demand ones, thus the same good that had cost roughly $3 per pound in the summer cost nearly $10 per pound by March 2013 simply because of changes in supply and demand. Between summer and winter, supply changes outweighed demand effects in the market for Maine lobsters (as evident in the large increase in price), so I am hopeful that lobster prices will drop in the coming months as supply increases so that I can enjoy my favorite butter conduit once more! 1. Using a supply and demand diagram, illustrate the shifts in demand and supply after the lobster season ends. Be sure to pay attention to the magnitudes of your shifts so that the equilibrium price rises as described in the article. 2. If lobster fishermen have a bad catch this summer, what would you expect to happen to the price of lobster in Maine in July? 3. How do fluctuations in the market price for lobster affect other markets for food products such as steak and chicken?